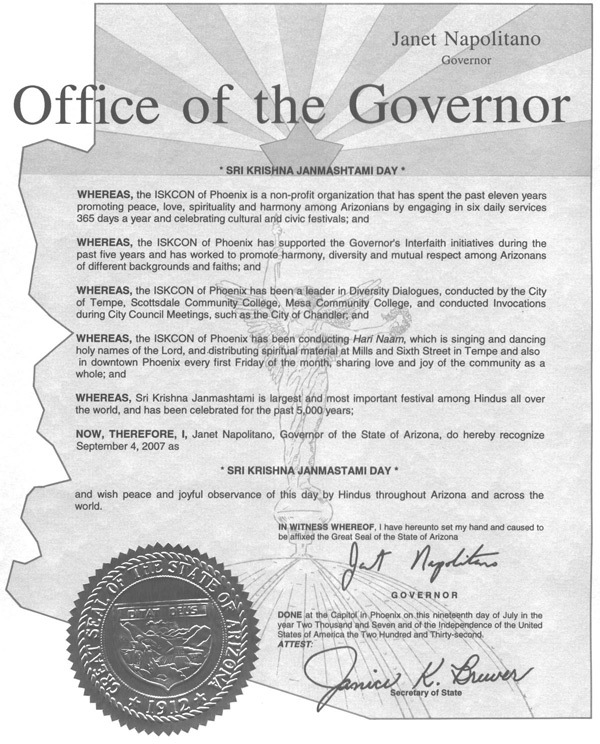 Bhaktin Janet (Napolitano)- as His Holiness Ganapati Swami Maharaja says- the Governor of Arizona, U S A - issued another Proclamation for Sri Krishna Janmashtami, Tuesday September 4, 2007. Last year, she became the first ever government official any where in the world to issue a Proclamation for Sri Krishna Janmashtami. In it, she recognized “Hari Naam” - singing and chanting publicly on streets - conducted by ISKCON of Phoenix in Tempe and downtown Phoenix, Arizona and continued . . . . : ” Sri Krishna Janmashtami is the largest and most important festival among Hindus all over the world, and has been celebrated for the past 5,000 years”. DONE at the Capitol in Phoenix on this nineteenth day of July in the year Two Thousand and Seven and of the Independence of the United States of America the Two Hundred and Thirty-second. Please join us in celebrating the Appearance Day of Lord Sri Krishna on Tuesday September 4, 2007 from 8:00 pm until midnight! Governor Janet Napolitano’s PROCLAMATION attached herewith. Jannah Scott, Policy Advisor to the Governor will be Chief Guest. Prasadam- Blessed Dinner - pure vegetarian health food style. - a fruit (s) , bottled water and flowers and leaves are most pleasing!